There are many resources on this website to assist you in planting a bee friendly garden, with a variety of flower lists and handy tips. 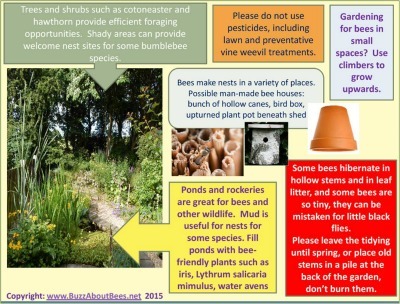 To supplement this information, I have created a 'Bee Friendly Gardening' Poster set, which is a downloadable PDF file, consisting of 3 pages of tips. It can be printed and shared with garden clubs, schools and allotment societies. To download, click this link (opens a new window - may need a little time depending on your computer). - Contrary to popular belief, bee friendly does not have to mean 'wild' or 'messy'. 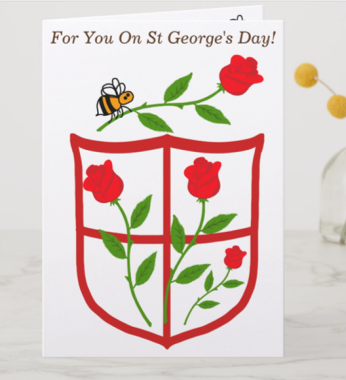 It is even possible to have a formal, neat garden, and yet have a bee friendly garden, as long as you include the right selection of plants and cut out pesticides. 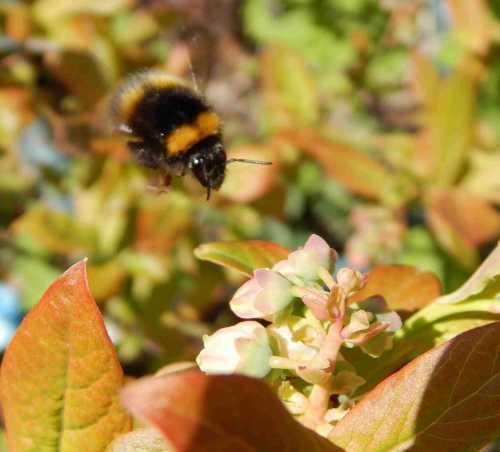 - A bee friendly garden does not have to be high maintenance either. With the correct selection of plants and ground cover, it can actually be designed to be low maintenance. - You don’t have to include wildflowers, but if you have a border, why not include a few? A wildflower lawn is wonderful, but if it is not practical for you, don't worry, there are other things you can add to your garden. - You don’t need to have a lot of space. You just need to make the most of the space you have. Think ‘feeding stations for bees’. - Perfect growing conditions are not necessary, though of course, they can make life easier. However, you will need to take into account the conditions that you have in terms of sunlight, soil, rain, wind, and then select plants accordingly. Please do not use insecticides, including lawn treatments and vine weevil preparations, and do check that your seeds or plants are not laced with pesticides when you purchase them. Identify your needs and wants from a garden, as well as those of your family, from the outset (your garden is for you to enjoy too!). Research the kinds of bees you could attract to the area, or whether you wish to keep honey bees. This will affect the choice of plants. 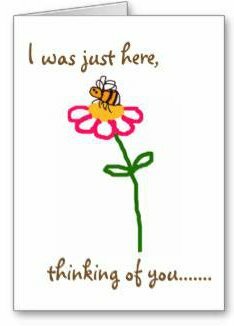 Please remember, bees come in all shapes and sizes, with different species sometimes favouring different flower shapes. Research the local area and your own planting conditions. How can you best meet the needs and plug any 'planting gaps' for the bees you could attract? Draw out your plan, taking into account positions of plants, variety, and flowering season. 1. Identify your needs and wants from a garden, as well as those of your family. I have learned this from experience: be realistic and practical, otherwise you may find yourself going to the pointless expense and effort of changing it later. If, for example, you have young children who run around in open toed sandals in summer time, you may think twice about a flowering lawn attractive to bees, as tiny toes could accidentally get stung. If your garden is sufficiently large to enable you to dedicate a separate area to a flowering lawn, then obviously, that’s a different matter. Also, it's no use creating a garden you and your family cannot enjoy, and there is no need to do so. Some years ago, I tried to convert our small back garden into a mini-meadow, by allowing the lawn to revert to whatever would naturally grow through the lawn. After a couple of years, we had very little floral variety, and a garden that we ourselves gained little enjoyment from. There were very few pollinator visitors, and the only ones to visit came to the one or two dandelions and the long established cotoneaster tree and ivy at the back of the garden. So I decided to add additional wildflower seeds and plug plants. There was some improvement, but the flowering period was short, and we gained little pleasure from the garden ourselves. In the end I felt frustrated. I wanted a garden we could enjoy more, and to grow some foods. I began to realise I could redesign the garden along more conventional lines, and yet probably attract more wildlife. Eventually, we redesigned the garden to include 2 flower borders, with wildflower varieties within the borders, fruit, a greenhouse, soft fruit patch and some vegetables, and a makeover of the pond and patio area. We now get far more species of pollinators than we did before, and we enjoy our garden! I state this not to discourage you from creating a 'wildflower area' - indeed, I have pages about it. However, it's worth stopping to think first about the kind of garden you want to have so that you can create a winning situation for all! 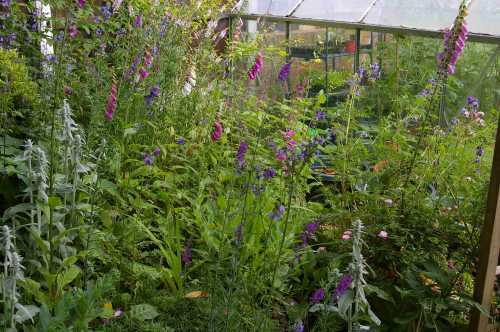 Below is an image of a very small but diverse patch behind my greenhouse. It contains wildflowers: foxglove and hedge woundwort. It is also planted with campanula, Jacob's ladder, toadflax and bluebells in spring. I get lots of bees in this little patch, including bumbles and honey bees, leafcutters, chocolate mining bees, and wool carders. Yippee! I also have a solitary bee house with mason bees! 2. Research the kinds of bees you could attract to the area, or whether you wish to keep honey bees. This will affect the choice of plants. I recommend you do some research into local species, and the kinds of plants they need. This is a great opportunity to provide forage for species that need to revive population numbers, and is especially interesting for the conservation minded. To find out about species local to you, do some investigation online. Your local environment agency or conservation organisations may be a good place to start. 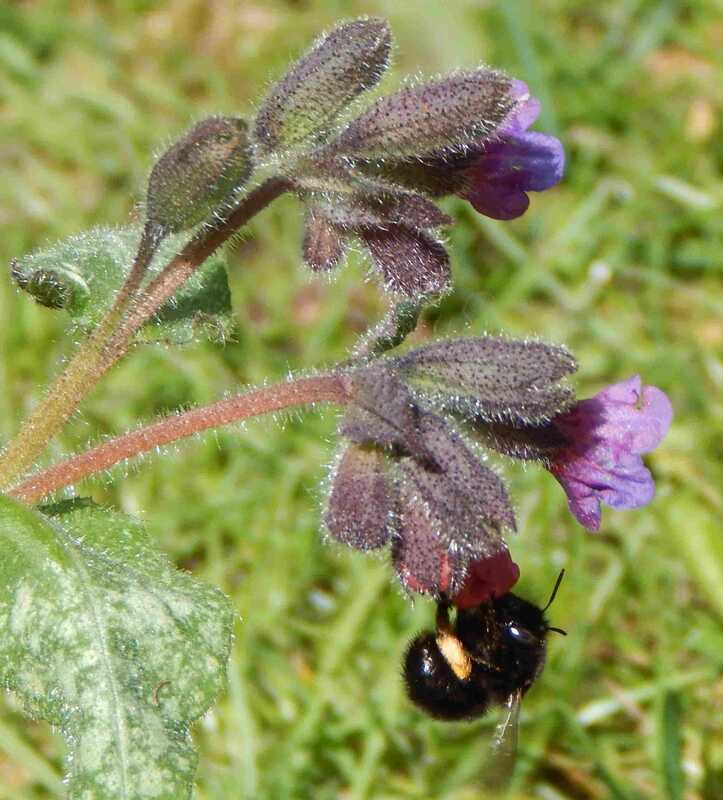 A few years ago, I decided I wanted to attract hairy footed flower bees. It is especially keen on pulmonaria, so this is what I planted in my garden, as I had seen little of it in the area. I began to see this species of bee 2 years later. I am working on increasing my patch of pulmonaria. You may or may not have to wait so long for your target species to appear, but take a long term view, and ensure you can provide for the species adequately. 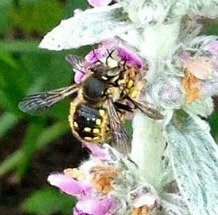 I also wanted to attract wool carder bees, so I planted lamb’s ear, again, because I didn’t see much of this plant around. I have had to wait longer for this species to show up – about 4 years, despite having 3 good sized patches of this flower type, but other bees have enjoyed foraging on the plant in the meantime. I have also been dividing the plant to give to neighbours, in order to ensure there are plenty of ‘feeding stations’ for these bees. I’ve noticed that the same plant will reach its peak flowering stage at slightly different times, in other people's gardens, depending on the aspect and growing conditions. I therefore feel I am extending the potential availability of forage for wool carders, by dividing and sharing plants with neighbours. On the other hand, there is a lot of comfrey in the area, so I have decided there is no need for me to plant this in my garden. 3. Research the local area and your own planting conditions. 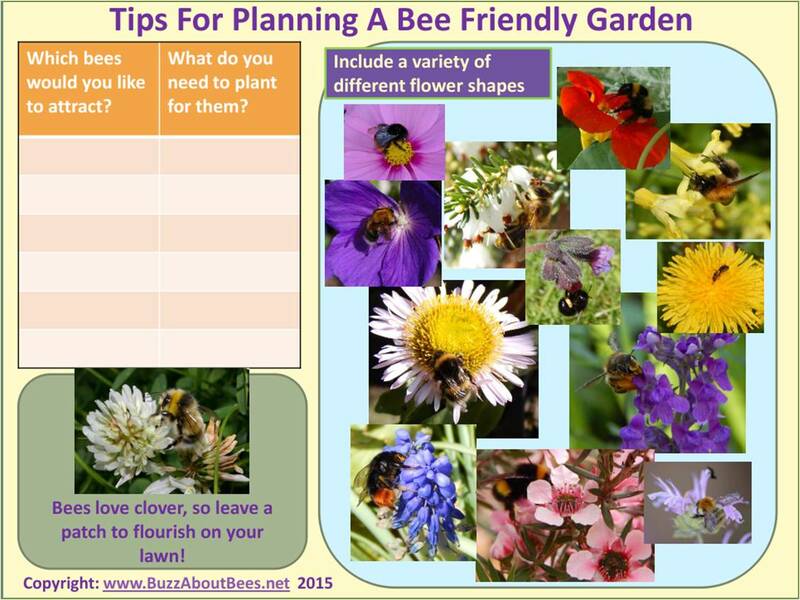 How can you best meet the needs and plug any 'planting gaps' for the bees you could attract. Take a walk around the area, and ensure you do so through the year. Make a note of vegetation that is already supplied in ample quantity, such that this need for bees has already been met. 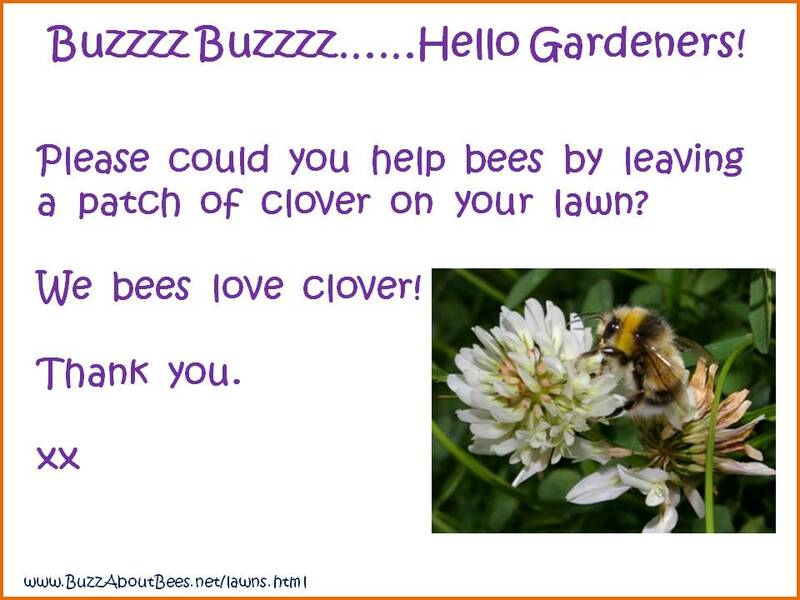 Make a note of any gaps you would like to fill in order to help the bees. 4. Draw out your plan, taking into account positions of plants, variety, and flowering season. This could vary from a rough sketch, to a carefully measured scale drawing. Take a photograph and print it out. Draw your designs on top of the photograph to help you visualise the scale and design. Pay attention to the sunny spots in your garden, and mark these on your plan. However, there are also plants and bulbs you can add to dappled shady areas - read more. I tend to use markers outside. For example, we decided to build a greenhouse, and so measured out the dimensions and marked them using string and canes. This really helped us understand the scale of the greenhouse in proportion with the rest of the garden, and plan the flower borders and soft fruit patch around it. When planning your 'What's In flower' calendar (see the 'Planting A Bee Friendly Garden' downloadable PDF), remember to consider any trees, shrubs and rockery plants, as well as food crop plants and lawn flowers (e.g. clover). These are all easily forgotten. To create an attractive bee friendly garden that doesn't break the bank. I have a number of plants and shrubs that are not very useful when you're wanting to plant a bee friendly garden, but I have decided to keep them because I like them. Most of my garden is wildlife friendly, but the garden is for me too! Make use of vertical space (i.e. grow upwards against walls, drain pipes, canes in the ground), use hanging baskets, planters and window boxes, make use of the grassed area. See Gardening For Bees In Small Spaces. Opt for flowering shrubs and low maintenance trees and climbers, as well as bulbs and perennial plants. Clover lawns need less cutting than grass lawns, and wildflower meadows only need to be cut a couple of times a year. If you want a certain degree of neatness, use a mulch which will also help to keep in the moisture. Swap plants with friends, divide them, look out for free offers.....see my tips Free Plants For Bees and Free Wildflower Seeds. Tricky conditions, such as shade, dry conditions and clay soil, can all be taken account of in your choice of plants. See Gardening for bees in problem places. In summary: plant a bee friendly garden you and your loved ones can also enjoy, and no doubt you'll feel encouraged to spend time outdoors, observing nature close up.